President Trump is repeatedly asserting that the economy under his presidency (in contrast to that of his predecessor) is booming, with economic growth and jobs numbers that are unprecedented, and all a sign of his superb management skills. The economy is indeed doing well, from a short-term perspective. Growth has been good and unemployment is low. But this is just a continuation of the trends that had been underway for most of Obama’s two terms in office (subsequent to his initial stabilization of an economy, that was in freefall as he entered office). However, and importantly, the recent growth and jobs numbers are only being achieved with a high and rising fiscal deficit. Federal government spending is now growing (in contrast to sharp cuts between 2010 and 2014, after which it was kept largely flat until mid-2017), while taxes (especially for the rich and for corporations) have been cut. This has led to standard Keynesian stimulus, helping to keep growth up, but at precisely the wrong time. Such stimulus was needed between 2010 and 2014, when unemployment was still high and declining only slowly. Imagine what could have been done then to re-build our infrastructure, employing workers (and equipment) that were instead idle. But now, with the economy at full employment, such policy instead has to be met with the Fed raising interest rates. 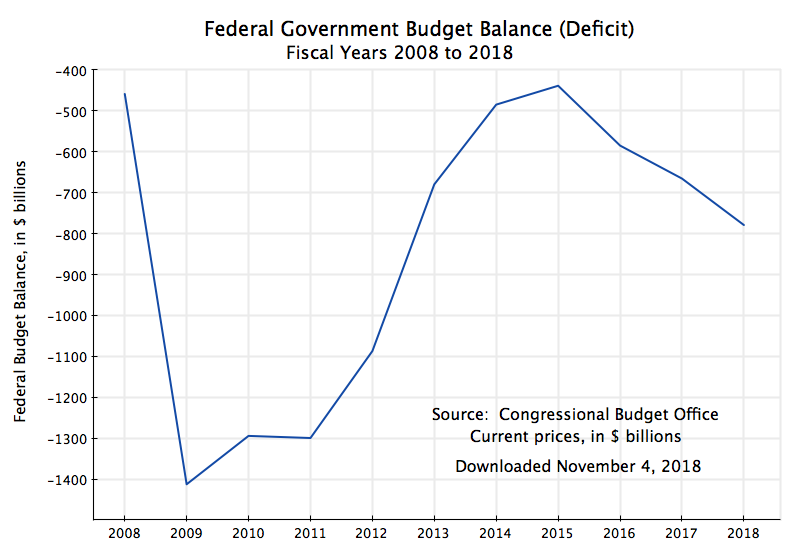 And with rising government expenditures and falling tax revenues, the result has been a rise in the fiscal deficit to a level that is unprecedented for the US at a time when the country is not at war and the economy is at or close to full employment. One sees the impact especially clearly in the amounts the US Treasury has to borrow on the market to cover the deficit. It has soared in 2018. This blog post will look at these developments, tracing developments from 2008 (the year before Obama took office) to what the most recent data allow. With this context, one can see what has been special, or not, under Trump. First a note on sources: Figures on real GDP, on foreign trade, and on government expenditures, are from the National Income and Product Accounts (NIPA) produced by the Bureau of Economic Analysis (BEA) of the Department of Commerce. Figures on employment and unemployment are from the Bureau of Labor Statistics (BLS) of the Department of Labor. Figures on the federal budget deficit are from the Congressional Budget Office (CBO). And figures on government borrowing are from the US Treasury. First, what has happened to overall output, and to jobs? 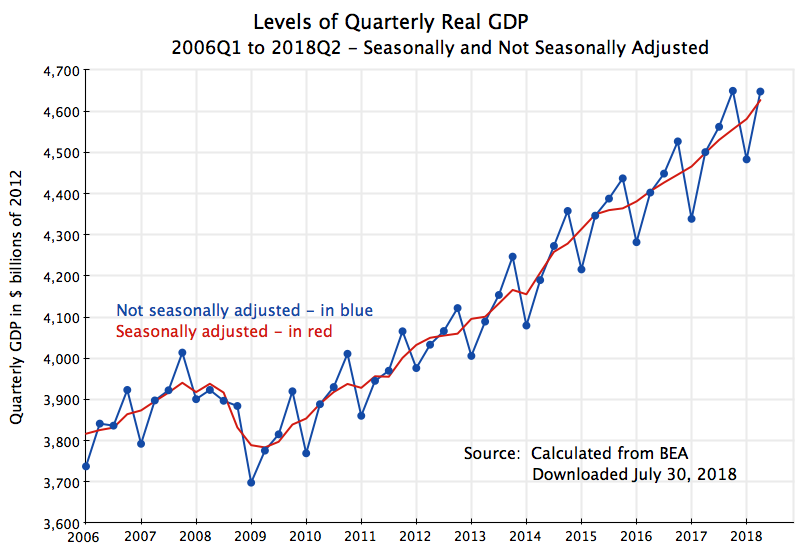 The chart at the top of this post shows the growth of real GDP, presented in terms of growth over the same period one year before (in order to even out the normal quarterly fluctuations). GDP was collapsing when Obama took office in January 2009. He was then able to turn this around quickly, with positive quarterly growth returning in mid-2009, and by mid-2010 GDP was growing at a pace of over 3% (in terms of growth over the year-earlier period). It then fluctuated within a range from about 1% to almost 4% for the remainder of his term in office. It would have been higher had the Republican Congress not forced cuts in fiscal expenditures despite the continued unemployment. But growth still averaged 2.2% per annum in real terms from mid-2009 to end-2016, despite those cuts. GDP growth under Trump hit 3.0% (over the same period one year before) in the third quarter of 2018. This is good. And it is the best such growth since … 2015. That is not really so special. Jobs were collapsing when Obama took office, he was quickly able to stabilize this with the stimulus package and other measures (especially by the Fed), and job growth resumed. 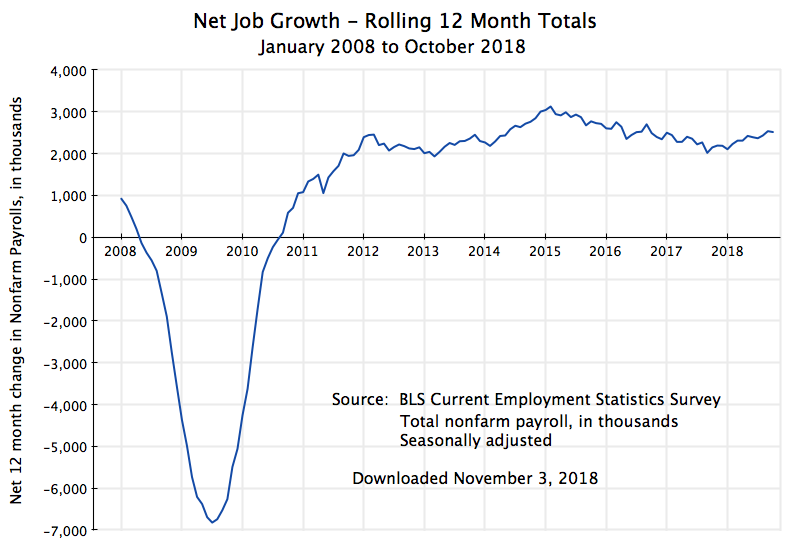 By late 2011, net job growth (in terms of rolling 12-month totals (which is the same as the increase over what jobs were one year before) was over 2 million per year. It went to as high as 3 million by early 2015. Under Trump, it hit 2 1/2 million by September 2018. This is pretty good, especially with the economy now at or close to full employment. And it is the best since … January 2017, the month Obama left office. Unemployment was rising rapidly as Obama was inaugurated, and hit 10% in late 2009. It then fell, and at a remarkably steady pace. It could have fallen faster had government spending not been cut back, but nonetheless it was falling. And this has continued under Trump. While commendable, it is not a miracle. Trump has also launched a trade war. Starting in late 2017, high tariffs were imposed on imports of certain foreign-produced products, with such tariffs then raised and extended to other products when foreign countries responded (as one would expect) with tariffs of their own on selected US products. Trump claims his new tariffs will reduce the US trade deficit. As discussed in an earlier blog post, such a belief reflects a fundamental misunderstanding of how the trade balance is determined. The trade deficit has not been reduced – it has grown in 2018. While it might appear there had been some recovery (reduction in the deficit) in the second quarter of the year, this was due to special factors. Exports primarily of soybeans and corn to China (but also other products, and to other countries where new tariffs were anticipated) were rushed out in that quarter in order arrive before retaliatory tariffs were imposed (which they were – in July 2018 in the case of China). But this was simply a bringing forward of products that, under normal conditions, would have been exported later. And as one sees, the trade balance returned to its previous path in the third quarter. The growing trade imbalance is a concern. For 2018, it is on course for reaching 5% of GDP (when measured in constant prices of 2012). But as was discussed in the earlier blog post on the determination of the trade balance, it is not tariffs which determine what that overall balance will be for the economy. Rather, it is basic macro factors (the balance between domestic savings and domestic investment) that determine what the overall trade balance will be. Tariffs may affect the pattern of trade (shifting imports and exports from one country to another), but they won’t reduce the overall deficit unless the domestic savings/investment balance is changed. And tariffs have little effect on that balance. And while the trend of a growing trade imbalance since Trump took office is a continuation of the trend seen in the years before, when Obama was president, there is a key difference. Under Obama, the trade deficit did increase (become more negative), especially from its lowest point in the middle of 2009. But this increase in the deficit was not driven by higher government spending – government spending on goods and services (both as a share of GDP and in constant dollar terms) actually fell. That is, government savings rose (dissavings was reduced, as there was a deficit). Private domestic savings was also largely unchanged (as a share of GDP). Rather, what drove the higher trade deficit during Obama’s term was the recovery in private investment from the low point it had reached in the 2008/09 recession. The situation under Trump is different. Government spending is now growing, as is the government deficit, and this is driving the trade deficit higher. We will discuss this next. This was foolish. Unemployment was over 9 1/2% in mid-2010, and still over 6 1/2% in late-2013 (see the chart of the unemployment rate above). And while the unemployment rate did fall over this period, there was justified criticism that the pace of recovery was slow. The cuts in government spending during this period acted as a major drag on the economy, holding back the pace of recovery. Never before had a US administration done this in the period after a downturn (at least not in the last half-century where I have examined the data). Government spending grew especially rapidly under Reagan following the 1981/82 downturn. 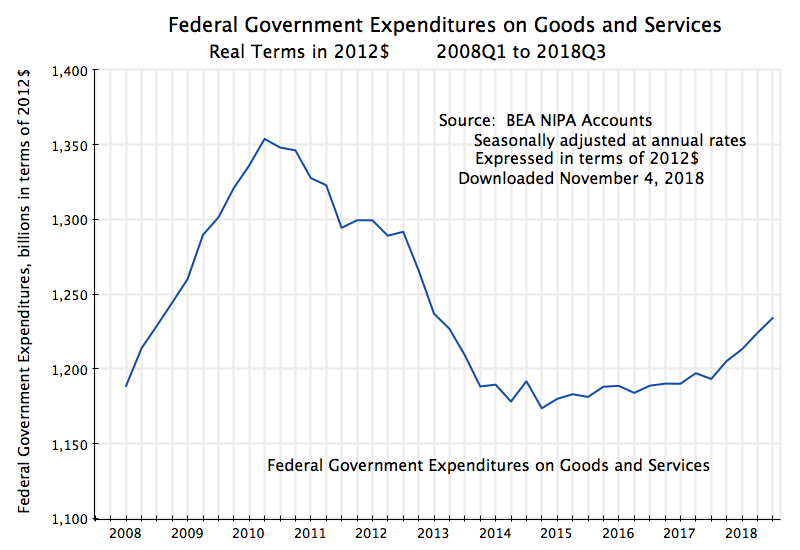 Federal government spending on goods and services was then essentially flat in real terms from late 2013 to the end of Obama’s term in office. And this more or less continued through FY2017 (the last budget of Obama), i.e. through the third quarter of CY2018. But then, in the fourth quarter of CY2017 (the first quarter of FY2018, as the fiscal year runs from October to September), in the first full budget under Trump, federal government spending started to rise sharply. See the chart above. And this has continued. There are certainly high priority government spending needs. But the sequencing has been terribly mismanaged. Higher government spending (e.g. to repair our public infrastructure) could have been carried out when unemployment was still high. Utilizing idle resources, one would not only have put people to work, but also would have done this at little cost to the overall economy. The workers were unemployed otherwise. But higher government spending now, when unemployment is low, means that workers hired for government-funded projects have to be drawn from other activities. While the unemployment rate can be squeezed downward some, and has been, there is a limit to how far this can go. And since we are close to that limit, the Fed is raising interest rates in order to curtail other spending. One sees this in the numbers. Overall private fixed investment fell at an annual rate of 0.3% in the third quarter of 2018 (based on the initial estimates released by the BEA in late October), led by a 7.9% fall in business investment in structures (offices, etc.) and by a 4.0% fall in residential investment (homes). While these are figures only for one quarter (there was a deceleration in the second quarter, but not an absolute fall), and can be expected to eventually change (with the economy growing, investment will at some point need to rise to catch up), the direction so far is worrisome. And note also that this fall in the pace of investment has happened despite the huge cuts in corporate taxes from the start of this year. Trump officials and Republicans in Congress asserted that the cuts in taxes on corporate profits would lead to a surge in investment. Many economists (including myself, in the post cited above) noted that there was little reason to believe such tax cuts would sput corporate investment. Such investment in the US is not now constrained by a lack of available cash to the corporations, so giving them more cash is not going to make much of a difference. Rather, that windfall would instead lead corporations to increase dividends as well as share buybacks in order to distribute the excess cash to their shareholders. And that is indeed what has happened, with share buybacks hitting record levels this year. 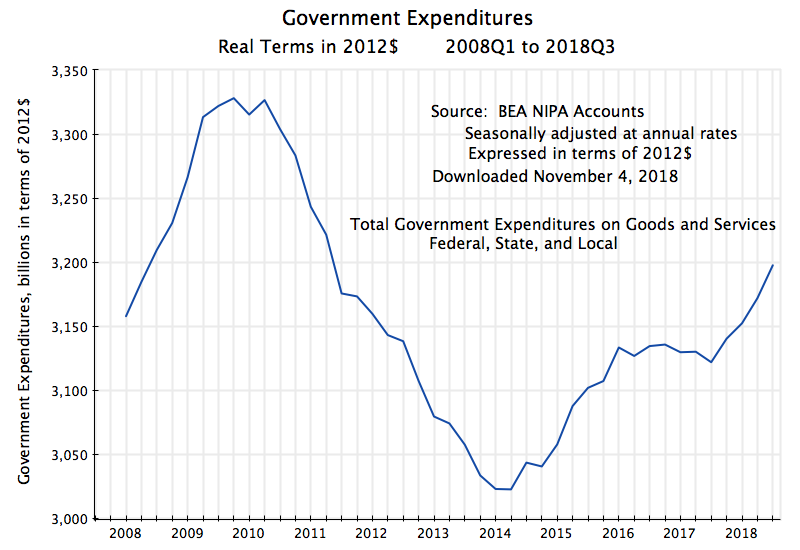 This mostly follows the same pattern as seen above for federal government spending on goods and services, with the exception that there was an increase in total government spending from early 2014 to early-2016, when federal spending was largely flat. This may explain, in part, the relatively better growth in GDP seen over that period (see the chart at the top of this post), and then the slower pace in 2016 as all spending leveled off. But then, starting in late-2017, total government expenditures on goods and services started to rise. It was, however, largely driven by the federal government component. Even though federal government spending accounted only for a bit over one-third (38%) of total government spending on goods and services in the quarter when Trump took office, almost two-thirds (65%) of the increase in government spending since then was due to higher spending by the federal government. All this is classical Keynesian stimulus, but at a time when the economy is close to full employment. So far we have focused on government spending on goods and services, as that is the component of government spending which enters directly as a component of GDP spending. It is also the component of the government accounts which will in general have the largest multiplier effect on GDP. But to arrive at the overall fiscal deficit, one must also take into account government spending on transfers (such as for Social Security), as well as tax revenues. For these, and for the overall deficit, it is best to move to fiscal year numbers, where the Congressional Budget Office (CBO) provides the most easily accessible and up-to-date figures. The deficit is now growing (the fiscal balance is becoming more negative) and indeed has been since FY2016. What happened in FY2016? Primarily there was a sharp reduction in the pace of tax revenues being collected. And this has continued through FY2018, spurred further by the major tax cut bill of December 2017. Taxes had been rising, along with the economic recovery, increasing by an average of $217 billion per year between FY2010 and FY2015 (calculated from CBO figures), but this then decelerated to a pace of just $26 billion per year between FY2015 and FY2018, and just $13 billion in FY2018. The rate of growth in taxes between FY2015 and FY2018 was just 0.8%, or less even than just inflation. Federal government spending, including on transfers, also rose over this period, but by less than taxes fell. Overall federal government spending rose by an average of just $46 billion per year between FY2010 and FY2015 (a rate of growth of 1.3% per annum, or less than inflation in those years), and then by $140 billion per year (in nominal dollar terms) between FY2015 and FY2018. But this step up in overall spending (of $94 billion per year) was well less than the step down in the pace of tax collection (a reduction of $191 billion per year, the difference between $217 billion annual growth over FY2010-15 and the $26 billion annual growth over FY2015-18). That is, about two-thirds (67%) of the increase in the fiscal deficit since FY2015 can be attributed to taxes being cut, and just one-third (33%) to spending going up. Looking forward, this is expected to get far worse. As was discussed in an earlier post on this blog, the CBO is forecasting (in their most recent forecast, from April 2018) that the fiscal deficits under Trump will reach close to $1 trillion in FY2019, and will exceed 5% of GDP for most of the 2020s. This is unprecedented for the US economy at full employment, other than during World War II. Furthermore, these CBO forecasts are under the optimistic scenario that there will be no economic downturn over this period. But that has never happened before in the US. These figures are for calendar years, and the number for 2018 includes what the US Treasury announced on October 29 it expects to borrow in the fourth quarter. Note this borrowing is what the Treasury does in the regular, commercial, markets, and is a net figure (i.e. new borrowing less repayment of debt coming due). It comes after whatever the net impact of public trust fund operations (such as for the Social Security Trust Fund) is on Treasury funding needs. The turnaround in 2018 is stark. 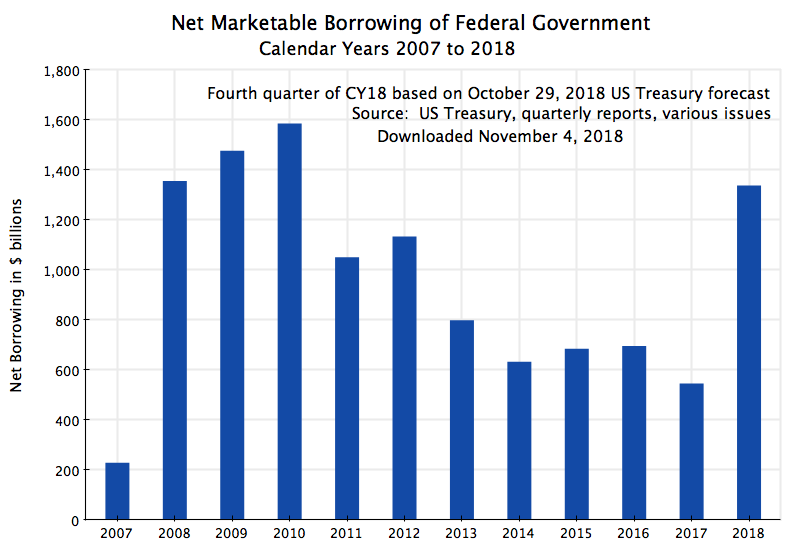 The US Treasury now expects to borrow in the financial markets, net, a total of $1,338 billion in 2018, up from $546 billion in 2017. And this is at time of low unemployment, in sharp contrast to 2008 to 2010, when the economy had fallen into the worst economic downturn since the Great Depression Tax revenues were then low (incomes were low) while spending needed to be kept up. The last time unemployment was low and similar to what it is now, in the late-1990s during the Clinton administration, the fiscal accounts were in surplus. They are far from that now. The economy has continued to grow since Trump took office, with GDP and employment rising and unemployment falling. This has been at rates much the same as we saw under Obama. There is, however, one big difference. Fiscal deficits are now rising rapidly. Such deficits are unprecedented for the US at a time when unemployment is low. And the deficits have led to a sharp jump in Treasury borrowing needs. These deficits are forecast to get worse in the coming years even if the economy should remain at full employment. Yet there will eventually be a downturn. There always has been. And when that happens, deficits will jump even further, as taxes will fall in a downturn while spending needs will rise. Other countries have tried such populist economic policies as Trump is now following, when despite high fiscal deficits at a time of full employment, taxes are cut while government spending is raised. They have always, in the end, led to disasters. The Bureau of Economic Analysis (BEA) released on July 27 its initial estimate of GDP growth in the second quarter of 2018 (what it technically calls its “advance estimate”). It was a good report: Its initial estimate is that GDP grew at an annualized rate of 4.1% in real terms in the quarter. Such growth, if sustained, would be excellent. But as many analysts noted, there are good reasons to believe that such a growth rate will not be sustained. There were special, one-time, factors, such as that the second quarter growth (at a 4.1% annual rate) had followed a relatively modest rate of growth in the first quarter of 2.2%. Taking the two together, the growth was a good, but not outstanding, rate of 3.1%. More fundamentally, with the economy now at full employment, few (other than Trump) expect growth at a sustained rate of 4% or more. Federal Reserve Board members, for example, on average expect GDP growth of 2.8% in 2018 as a whole, with this coming down to a rate of 1.8% in the longer run. And the Congression Budget Office (in forecasts published in April) is forecasting GDP growth of 3.0% in 2018, coming down to an average rate of 1.8% over 2018 to 2028. The fundamental issue is that the population is aging, so the growth rate of the labor force is slowing. As discussed in an earlier post on this blog, unless the productivity of those workers started to grow at an unprecedented rate (faster than has ever been achieved in the post-World War II period), we cannot expect GDP to grow for a sustained period going forward at a rate of 3%, much less 4%. But there will be quarter to quarter fluctuations. 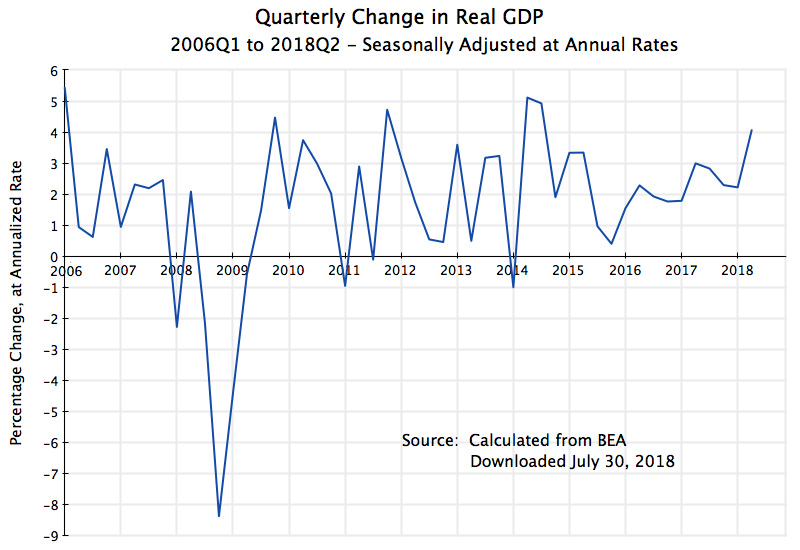 As seen in the chart at the top of this post covering the period just since 2006, there have been a number of quarters in recent years where GDP grew at an annualized rate of 4% or more. Indeed, growth reached 5.1% in the second quarter of 2012, with this followed by an also high 4.9% rate in the next quarter. But it then came back down. And there were also two quarters (setting aside the period of the 2008/09 recession) which had growth of a negative 1.0%. On average, GDP growth was around 2% (at an annual rate) during Obama’s two terms in office (2.2% annually from the end of the recession in mid-2009). Seen in this context, the 4.1% rate in the initial estimate for the second quarter of 2018 was not special. There have been a number of such cases (and with even substantially higher growth rates for a quarter or even two) in the recent past, even though average growth was just half that. The quarterly rates bounce around. But it is of interest to examine why they bounce around so much, and that is the purpose of this blog post. There are a number of reasons why one should not be surprised that these quarter to quarter growth rates in GDP vary as they do. I will present several here. And note that these reasons are not mutually exclusive. Several of them could be acting together and be significant factors in any given quarter. To start, and to be complete, one should not exclude the possibility that the growth in the quarter (or the lack of it) was genuine. Perhaps output did speed up (or slow down) as estimated. Car plants might go on extra shifts (or close for a period) due to consumers wanting to buy more cars (or fewer cars) in the period for some reason. There might also be some policy change that might temporarily spur production (or the opposite). For example, Trump’s recent trade measures, and the response to them from our trading partners, may have brought forward production and trade that would have been undertaken later in the year, in order to avoid tariffs threatened to be imposed later. This could change quarterly GDP even though GDP for the year as a whole will not be affected positively (indeed the overall impact would likely be negative). [Side note: But one special factor in this past quarter, cited in numerous news reports (see, for example, here, here, here, here, and here), was that a jump in exports of soybeans was a key reason for the higher-than-recently-achieved rate of GDP growth. This was not correct. Soybean exports did indeed rise sharply, with this attributed to the response threatened by China and others to the new tariffs Trump has imposed. China and others said they would respond with higher tariffs of their own, targeted on products such as soybeans coming from the US. There was thus a rush to export soybeans in the period between when China first announced they would impose such retaliatory tariffs (in late March) and when they were then imposed (ultimately on July 6). But while soybean exports did indeed increase sharply in the April to June quarter, soybeans are a crop that takes many months to grow. Whatever increase in shipments there was had to come out of inventories. An increase in exports would have to be matched by a similar decrease in inventories, with this true also for corn and other such crops. There would be a similar issue for any increase in exports of Kentucky bourbon, also a target of retaliatory tariffs. Any decent bourbon is aged for at least three years. One must keep in mind that GDP (Gross Domestic Product) is a measure of production, and the only production that might have followed from the increased exports of soybeans or similar products would have been of packing and shipping services. But packing and shipping costs are only a relatively small share of the total value of the products being exported. So one should not exclude the possibility that the fluctuation in the quarterly growth rate is real. But it could be due to many other factors as well, as we will discuss below. Thus it is not correct to say that “GDP grew by 4.1% in the second quarter”. 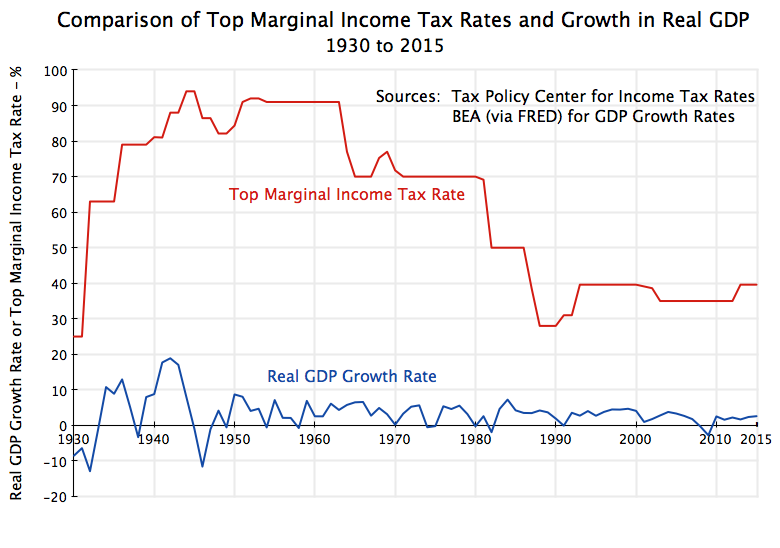 It did not – it grew by 1.0%. What is correct is to say that “GDP grew at an annualized rate of 4.1% in the second quarter”. Not all national statistical agencies present such figures in annualized terms. European agencies, for example, generally present the quarterly growth figures as simply the growth in the quarter. Thus, for example, Eurostat on June 7 announced that GDP in the eurozone rose by an estimated 0.4% in the first quarter of 2018. This 0.4% was the growth in the quarter. But that 0.4% growth figure would be equivalent to growth of 1.6% on an annualized basis (actually 1.61%, if the growth had been precisely 0.400%). Furthermore, the European agencies will generally also focus on the growth in GDP over what it had been a year earlier in that same quarter. In the first quarter of 2018, this growth over the year-earlier period was an estimated 2.5% according to the Eurostat release. But the growth since the year-earlier period is not the same as the growth in the current quarter at an annualized rate. They can easily be confused if one is not aware of the conventions used by the different agencies. Also along the lines of how we might misleadingly interpret figures, one needs to keep in mind that while the quarterly growth rates can, and do, bounce around a lot, the underlying levels of GDP are really not changing much. While a 4% annual growth rate is four times as high as a 1% growth rate, for example, the underlying level of GDP in one calendar quarter is only increasing to a level of about 101 (starting from a base of 100 in this example) with growth at a 4% annual rate, versus to a level of 100.25 when growth is at an annual rate of 1%. While such a difference in growth rates matters a great deal (indeed a huge deal) if sustained over time, the difference in any one quarter is not that much. Indeed, I personally find the estimated quarter to quarter levels of GDP in the US (after seasonal adjustment, which will be discussed below) to be surprisingly stable. Keep in mind that GDP is a flow, not a stock. It is like the flow of water in a river, not a stock such as the body of water in a reservoir. Flows can go sharply up and down, while stocks do not, and some may mistakenly treat the GDP figures in their mind as a stock rather than a flow. GDP measures the flow of goods and services produced over some period of time (a calendar quarter in the quarterly figures). A flow of GDP to 101 in some quarter (from a base of 100 in the preceding quarter) is not really that different to an increase to 100.25. While this would matter (and matter a good deal) if the different quarterly increases are sustained over time, this is not that significant when just for one quarter. Moving now to more substantive reasons why one should expect a significant amount of quarter to quarter volatility, one needs to recognize that GDP is estimated based on surveys and other such sources of statistical information. The Bureau of Economic Analysis (BEA) of the US Department of Commerce, which is responsible for the estimates of the GDP accounts in the US (which are formally called the National Income and Product Accounts, or NIPA), bases its estimates on a wide variety of surveys, samples of tax returns, and other such partial figures. The estimates are not based on a full and complete census of all production each quarter. Indeed, such an economic census is only undertaken once every five years, and is carried out by the US Census Bureau. One should also recognize that an estimate of real GDP depends on two measures, each of which is subject to sampling and other error. One does not, and cannot, measure “real GDP” directly. Rather, one estimates what nominal GDP has been (based on estimates in current dollars of the value of all economic transactions that enter into GDP), and then how much prices have changed. Price indices are estimated based on the prices of surveyed samples, and the components of real GDP are then estimated from the nominal GDP of the component divided by the relevant price index. Real GDP is only obtained indirectly. There will then be two sets of errors in the measurements: One for the nominal GDP flows and one for the price indices. And surveys, whether of income flows or of prices, are necessarily partial. Even if totally accurate for the firms and other entities sampled, one cannot say with certainty whether those sampled in that quarter are fully representative of everyone in the economy. This is in particular a problem (which the BEA recognizes) in capturing what is happening to newly established firms. Such firms will not be included in the samples used (as they did not exist when the samples were set up) and the experiences of such newly established firms can be quite different from those of established firms. And what I am calling here statistical “noise” encompasses more than simply sampling error. Indeed, sampling error (the fact that two samples will come up with different results simply due to the randomness of who is chosen) is probably the least concern. Rather, systemic issues arise whenever one is trying to infer measures at the national level from the results found in some survey. The results will depend, for example, on whether all the components were captured well, and even on how the questions are phrased. We will discuss below (in Section C, where we look at a comparison of estimates of GDP to estimates of Gross Domestic Income, or GDI, which in principle should be the same) that the statistical discrepancy between the estimates of GDP and GDI does not vary randomly from one quarter to the next but rather fairly smoothly (what economists and statisticians call “autocorrelation” – see Section C). This is an indication that there are systemic issues, and not simply something arising from sample randomness. Finally, even if that statistical error was small enough to allow one to be confident that we measured real GDP within an accuracy of just, say, +/- 1%, one would not then be able to say whether GDP in that quarter had increased at an annualized rate of about 4%, or decreased by about 4%. A small quarterly difference looms large when looked at in terms of annualized rates. I do not know what the actual statistical error might be in the GDP estimates, and it appears they are well less than +/- 1% (based on the volatility actually observed in the quarter to quarter figures). But a relatively small error in the estimates of real GDP in any quarter could still lead to quite substantial volatility in the estimates of the quarter to quarter growth. Economic activity varies over the course of the year, with predictable patterns. There is a seasonality to holidays, to when crops are grown, to when students graduate from school and enter the job market, and much much more. Thus the GDP data we normally focus on has been adjusted by various statistical methods to remove the seasonality factor, making use of past data to estimate what the patterns are. There is a regular pattern to GDP: It is relatively high in the last quarter of each year, relatively low in the first quarter, and somewhere in between in the second and third quarters. The seasonally adjusted series takes account of this, and is far smoother. Calculating quarterly growth rates from a series which has not been adjusted for seasonality would be misleading in the extreme, and not of much use. But adjusting for seasonality is not easy to do. While the best statisticians around have tried to come up with good statistical routines to do this, it is inherently difficult. A fundamental problem is that one can only look for patterns based on what they have been in the past, but the number of observations one has will necessarily be limited. If one went back to use 20 years of data, say, one would only have 20 observations to ascertain the statistical pattern. This is not much. One could go back further, but then one has the problem that the economy as it existed 30 or 40 years ago (and indeed even 20 years ago) was quite different from what it is now, and the seasonal patterns could also now be significantly different. While there are sophisticated statistical routines that have been developed to try to make best use of the available data (and the changes observed in the economy over time), this can only be imperfect. Indeed, the GDP estimates released by the BEA on July 27 incorporated a number of methodological changes (which we will discuss below), one of which was a major update to the statistical routines used for the seasonal adjustment calculations. 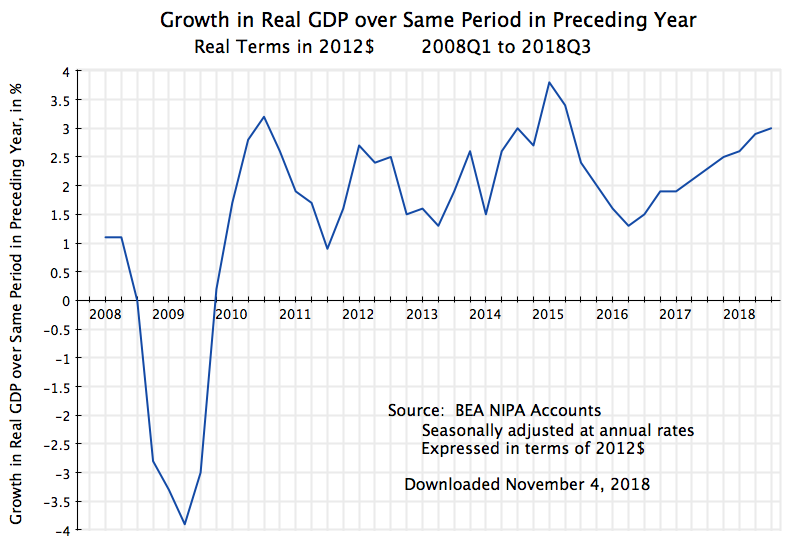 Many observers (including at the BEA) had noted in recent years that (seasonally adjusted) GDP growth in the first quarter of each year was unusually and consistently low. It then recovered in the second quarter. This did not look right. One aim of the update to the seasonal adjustment statistical routines was to address this issue. Whether it was fully successful is not fully clear. As seen in the chart at the top of this post (which reflects estimates that have been seasonally adjusted based on the new statistical routines), there still appear to be significant dips in the seasonally adjusted first quarter figures in many of the years (comparing the first quarter GDP figures to those just before and just after – i.e. in 2007, 2008, 2010, 2011, 2014, and perhaps 2017 and 2018. This would be more frequent than one would expect if the residual changes were now random over the period). However, this is an observation based just on a simple look at a limited sample. The BEA has looked at this far more carefully, and rigorously, and believes that the new seasonal adjustment routines it has developed have removed any residual seasonality in the series as estimated. The production of the goods and services that make up the flow of GDP will also differ on Saturdays, Sundays, and holidays. But the number of Saturdays, Sundays, and certain holidays may differ from one year to the next. While there are normally 13 Saturdays and 13 Sundays in each calendar quarter, and most holidays will be in the same quarter each year, this will not always be the case. For example, there were just 12 Sundays in the first quarter of 2018, rather than the normal 13. And there will be 14 Sundays in the third quarter of 2018, rather than the normal 13. In 2019, we will see a reversion to the “normal” 13 Sundays in each of the quarters. This could have an impact. Assume, just for the sake of illustration, that production of what goes into GDP is only one-half as much on a Saturday, Sunday, or holiday, than it is on a regular Monday through Friday workday. It will not be zero, as many stores, as well as certain industrial plants, are still open, and I am just using the one-half for illustration. Using this, and based on a simple check of the calendars for 2018 and 2019, one will find there were 62 regular, Monday through Friday, non-holiday workdays in the first quarter of 2018, while there will be 61 such regular workdays in the first quarter of 2019. The number of Saturdays, Sundays, and holidays were 28 in the first quarter of 2018 (equivalent to 14 regular workdays in terms of GDP produced, assuming the one-half figure), while the number of Saturdays, Sundays, and holidays will be 29 in the first quarter of 2019 (equivalent to 14.5 regular workdays). Thus the total regular work-day equivalents will be 76 in 2018 (equal to 62 plus 14), falling to 75.5 in 2019 (equal to 61 plus 14.5). This will be a reduction of 0.7% between the periods in 2018 and 2019 (75.5/76), or a fall of 2.6% at an annualized rate. This is not small. The changes due to the timing of holidays could matter even more, especially for certain countries around the world. Easter, for example, was celebrated in March (the first quarter) in 2013 and 2016, but came in April (the second quarter) in 2014, 2015, 2017, and 2018. In Europe and Latin America, it is customary to take up to a week of vacation around the Easter holidays. The change in economic activity from year to year, with Easter celebrated in one quarter in one year but a different one in the next, will make a significant difference to economic activity as measured in the quarter. And in Muslim countries, Ramadan (a month of fasting from sunrise to sunset), followed by the three-day celebration of Eid al-Fitr, will rotate through the full year (in terms of the Western calendar) as it is linked to the lunar cycle. Hence it would make sense to adjust the quarterly figures not only for the normal seasonal adjustment, but also for any changes in the number of weekends and holidays in some particular calendar quarter. Eurostat and most (but not all) European countries make such an adjustment for the number of working days in a quarter before they apply the seasonal adjustment factors. But I have not been able to find how the US handles this. The adjustment might be buried somehow in the seasonal adjustment routines, but I have not seen a document saying this. If no adjustment is made, then this might explain part of the quarterly fluctuations seen in the figures. As noted above, the GDP figures released on July 27 reflected a major update in the methodology followed by the BEA to arrive at its GDP estimates. Not only was there extensive work on the seasonal adjustment routines, but there were definitional and other changes. The accounts were also updated to reflect the findings from the 2012 Economic Census, and prices were changed from a previous base of 2009 to now 2012. The July 27 release summarized the changes, and more detail on what was done is available from a BEA report issued in April. And with the revisions in definitions and certain other methodological changes, the BEA revised its NIPA figures going all the way back to 1929, the first year with official GDP estimates. The BEA makes such changes on a regularly scheduled basis. There is normally an annual change released each year with the July report on GDP in the second quarter of the year. This annual change incorporates new weights (from recent annual surveys) and normally some limited methodological changes, and the published estimates are normally then revised going back three and a half years. See, for example, this description of what was done in July 2017. On top of this, there is then a much larger change once every five years. The findings from the most recent Economic Census (which is carried out every five years) are incorporated, seasonal adjustment factors are re-estimated, and major definitional or methodological changes may be incorporated. The July 2018 release reflected one of those five-year changes. It was the 15th such comprehensive revision to the NIPA accounts undertaken by the BEA. I stress this to make the point that the GDP figures are estimates, and as estimates are always subject to change. The professionals at the BEA are widely admired around the world for the quality of their work, and do an excellent job in my opinion. But no estimates will ever be perfect. One has to recognize that there will be a degree of uncertainty surrounding any such estimates, and that the quarter to quarter volatility observed will derive at least in part from the inherent uncertainty in any such estimates. One way to develop a feel for how much the changes in quarterly GDP may be due to the inherent uncertainty in the estimates is to compare it to the estimated quarterly changes in Gross Domestic Income (GDI). GDP (Gross Domestic Product) measures the value of everything produced. GDI measures the value of all incomes (wages, profits, rents, etc.) generated. In principle, the totals should be the same, as the value of whatever is produced accrues to someone as income. They should add up to the same thing. But the BEA arrives at its estimates of GDP and of GDI by different routes. As a consequence, the estimates of the totals will then differ. The differences are not huge in absolute amount, nor have they grown over time (as a share of GDP or of GDI). That is, on average the estimates match each other over time, with the same central tendency. But they differ by some amount in any individual quarter, and hence the quarter to quarter growth rates will differ. And for the reasons reviewed above, those slight changes in the levels in any individual quarter can translate into often major differences in the growth rates from one quarter to the next. And these differences may appear to be particularly large when the growth rates are then presented in annualized terms. As is seen, the alternative estimates of growth in any individual quarter can be quite different. There was an especially large difference in the first quarter of 2012, when the estimated growth in GDP was 3.2% at an annual rate, while the estimated growth in GDI was a giant 8.7%. Which is correct? Was the growth rate in the first quarter of 2012 3.2% (as found with the GDP estimate) or 8.7% (as found with the GDI estimate)? The answer is we do not know, and indeed that probably neither is correct. What is most likely is that the true figure is probably somewhere in between. Furthermore, and also moderating what the impact on the differences in the respective estimated growth rates will be, it is not the case that the estimates of GDP and GDI are statistically independent of each other, with the two bouncing around randomly with respect to each other. Rather, if one looks at what the BEA calls the “statistical discrepancy” (the difference between GDP and GDI), one finds that if, say, the estimate of GDP were above the estimate of GDI in one quarter, then it likely would also be above in the next quarter. Not by the same amount, and the differences would evolve over time, but moving more like waves than as balls ricocheting around. Economists and statisticians refer to this as “autocorrelation”, and it indicates that there is some systemic error in the estimates of GDP and of GDI, which carries over from one quarter to the next. What the source of that is, we do not know. If we did know, then it would be eliminated. But the fact such autocorrelation exists tells us that there is some source of systemic error in the measures of GDP and GDI, and we have not been able to discover the source. Estimates are estimates. We need to recognize that there will be statistical uncertainty in any such figures. Even if they even out over time, the estimated growth from one quarter to the next will reflect such statistical volatility. The differences seen in the estimated rates of growth in any one quarter for total output (estimated by way of GDP versus by way of GDI) provides a useful benchmark for how to judge the reported changes seen in growth for GDP in any individual quarter. The true volatility (for purely statistical reasons) is likely to be at least as much, if not more. There are many reasons, then, to expect the quarterly growth figures to bounce around. One should not place too much weight on the estimates from any individual quarter. It is the longer term trends that matter. The estimated figure for growth in GDP of 4.1% in the second quarter was not out of line with what has been seen in a number of quarters in recent years. But growth since mid-2009 has only been about one half as much on average, despite several quarters when estimated growth was well in excess of 4.1%. To conclude, some may find of interest three country cases I am personally familiar with which illustrate why one needs to exercise care, and with an understanding of the country context, when considering what is meaningful or not for reported figures on GDP growth. The countries are Japan, China, and an unidentified, but newly independent, former colony in the 1960s. a) Japan: In the late 1990s / early 2000s, while holding a position within the World Bank Group, I was responsible for assessments of the prospects and risks of the countries of East Asia where the World Bank was active. This was not long after the East Asia crisis of 1997, and the countries were just beginning to recover. Japan was important, both as a trading partner to the others and because Japan itself had gone through a somewhat similar crisis following 1990, when the Japanese financial bubble burst. As part of this, I followed closely the quarterly GDP growth figures for Japan. But as many analysts at the time noted, the quarter to quarter figures behaved in ways that were difficult to understand. Components went up when one would have thought they would go down (and vice versa), the quarterly changes were far more extreme than seen elsewhere, and in general the quarter to quarter fluctuations were difficult to make sense of. The volatility in the figures was far greater than one would have expected for an economy such as Japan’s. This view among analysts was such a common one that the government agency responsible for the estimates felt it necessary to issue a news release in June 2000 defending its work and addressing a number of the concerns that had been raised. I have no doubt that the Japanese government officials responsible for the estimates were well-qualified and serious professionals. But it is not easy to estimate GDP and its components, the underlying data on which the statisticians relied might have had problems (including sample sizes that were possibly too small), and there may have been segments of the economy (in the less formal sectors) which might not have been captured well. I have not followed closely in recent years, and do not know if the issues continue. But Japan’s case illustrates that even a sophisticated agency, with good professionals, can have difficulty in arriving at GDP estimates that behave as one would expect. b) China: The case of China illustrates the mirror image problem of what was found in Japan. While the Japanese GDP estimates bounced around far too sharply from one quarter to the next, the GDP estimates for China showed remarkable, and not believable, stability. Chinese growth rates have normally been presented as growth of GDP in the current period over what it was in the same period one year ago. Seasonal adjustment is then not needed, and indeed China only started to present seasonally adjusted figures in 2011. However, these estimates are still not fully accepted by many analysts. 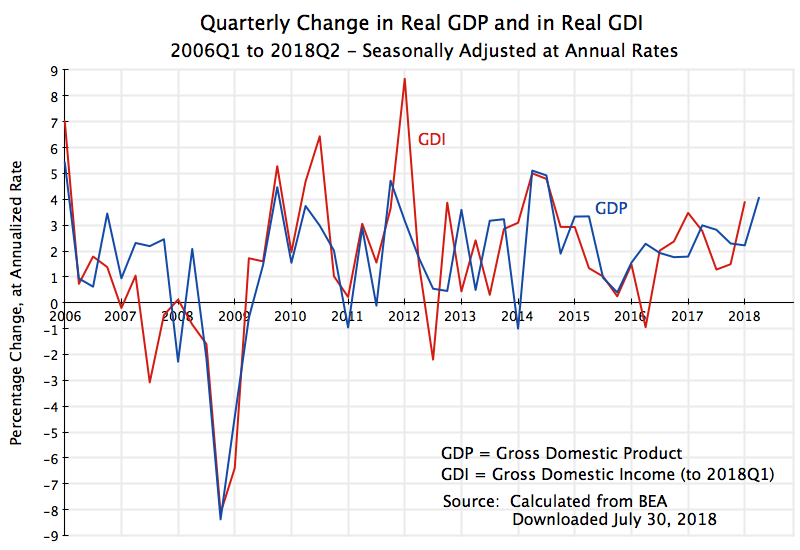 Comparing GDP in the current quarter to what it was in the same quarter a year before overcomes this, but at the cost that it does not present information on growth just in the quarter, as opposed to total growth over the preceding year. And the growth rates reported over the same quarter in the preceding year have been shockingly smooth. Indeed, in recent years (from the first quarter of 2015 through to the recently released figures for the second quarter of 2018), China’s reported growth of its GDP over the year-earlier period has not been more than 7.0% nor less than 6.7% in each and every quarter. Specifically, the year on year GDP growth rates from the first quarter of 2015 through to the second quarter of 2018 were (in sequence): 7.0%, 7.0%, 6.9%, 6.8%, 6.7%, 6.7%, 6.7%, 6.8%, 6.9%, 6.9%, 6.8%, 6.8%, 6.8%, and 6.7% (one can find the figures in, for example, the OECD database). Many find this less than credible. There are other problems as well in the Chinese numbers. For example, it has often been the case that the reported growth in provincial GDP of the 31 provincial level entities in China was higher in almost all of the 31 provinces, and sometimes even in all of the provinces, than GDP growth was in China as a whole. This is of course mathematically impossible, but not surprising when political rewards accrue to those with fast reported growth. With such weak credibility, analysts have resorted to coming up with proxies to serve as indicators of what quarter to quarter might have been. These might include electricity consumption, or railway tonnage carried, or similar indicators of economic production. Indeed, there is what has been labeled the “Li index”, named after Li Keqiang (who was vice premier when he formulated it, and later China’s premier). Li said he did not pay much attention to the official GDP statistics, but rather focused on a combination of electricity production, rail cargo shipments, and loan disbursements. Researchers at the Federal Reserve Bank of San Francisco who reproduced this and fitted it through some regression analysis found that it worked quite well. And the index I found most amusing is calculated using nighttime satellite images of China, with an estimation of how much more night-time illumination one finds over time. This “luminosity” index tracks well what might be going on with China’s GDP. c) An unidentified, newly independent, former colony: Finally, this is a story which I must admit I received third hand, but which sounds fully believable. In the mid-1970s I was working for a period in Kuala Lumpur, for the Government of Malaysia. As part of an economic modeling project I worked closely with the group in the national statistical office responsible for estimating GDP. The group was led by a very capable, and talkative, official (of Tamil origin), who related a story he had heard from a UN consultant who had worked closely with his group in the early 1970s to develop their system of national accounts. The story is of a newly independent country in the mid-1960s (whose name I was either not told or cannot remember), and its estimation of GDP. An IMF mission had visited it soon after independence, and as is standard, the IMF made forecasts of what GDP growth might be over the next several years. Such forecasts are necessary in order to come up with estimates for what the government accounts might be (as tax revenues will depend on GDP), for the trade accounts, for the respective deficits, and hence for what the financing needs might be. Such forecasts are rarely very good, especially for a newly independent country where much is changing. But something is needed. As time passed, the IMF received regular reports from the country on what estimated GDP growth actually was. What they found was that reported GDP growth was exactly what had been forecast. And when asked, the national statisticians responded that who were they to question what the IMF officials had said would happen! A debate now underway between the Trump Administration and others is on the question of how fast the economy can and will grow. Trump claimed during the presidential campaign that if elected, he would get the economy to grow at a sustained rate of 5% or even 6%. Since then the claim has been scaled back, to a 4% rate over the next decade according to the White House website (at least claimed on that website as I am writing this). And an even more modest rate of growth of 3% for GDP (to be reached in 2020, and sustained thereafter) was forecast in the budget OMB submitted to Congress in May of this year. But many economists question whether even a 3% growth rate for a sustained period is realistic, as would I. One needs to look at this systematically, and this post will describe one way economists would address this critically important question. It is not simply a matter of pulling some number out of the air (where the various figures presented by Trump and his administration, varying between 6% growth and 3%, suggests that that may not be far removed from what they did). One way to approach this is to recognize the simple identity: GDP will equal GDP per worker employed times the number of workers employed. Over time, growth in the number of workers who can be employed will be equal to the growth in the labor force, and we have a pretty good forecast for that will be from demographic projections. The other element will then depend on growth in how much GDP is produced per worker employed. This is the growth in productivity, and while more difficult to forecast, we have historical numbers which can provide a sense for what its growth might be, at best, going forward. The chart at the top of this post shows what it has been since 1947, and will be discussed in detail below. Forecasts that productivity will now start to grow at rates that are historically unprecedented need to be viewed with suspicion. Miracles rarely happen. I should also be clear that the question being examined is the maximum rate at which one can expect GDP to grow. That is, we are looking at growth in what economists call capacity GDP. Capacity GDP is what could be produced in the economy with all resources, in particular labor, being fully utilized. This is the full employment level of GDP, and the economy has been at or close to full employment since around 2015. Actual GDP can be less than capacity GDP when the economy is operating at less than full employment. But it cannot be more. Thus the question being examined is how fast the economy could grow, at most, for a sustained period going forward, not how fast it actually will grow. With mismanagement, such as what was seen in the government oversight of the financial markets (or, more accurately, the lack of such oversight) prior to the financial and economic collapse that began in 2008 in the final year of the Bush administration, the economy could go into a recession and actual GDP will fall below capacity GDP. But we will give Trump the benefit of the doubt and look at how fast capacity GDP could grow at, assuming the economy can and will remain at full employment. We will start with a look at what is expected for growth in the labor force and hence in the number of workers who can be employed. That is relatively straightforward, and the answer is not to expect much possible growth in GDP from this source. We will then look at productivity growth: what it has been in the past and whether it could grow at anything close to what is implicit in the Trump administration forecasts. Predicting what that actual rate of productivity growth might be is beyond the scope of this blog post. Rather, we will be looking at it whether it can grow as fast as is implied by the Trump forecasts. The answer is no. Every two years, the Bureau of Labor Statistics provides a detailed ten-year forecast of what it estimates the US labor force will be. The most recent such forecast was published in December 2015 and provided its forecast for 2024 (along with historical figures up to 2014). The basic story is that while the labor force is continuing to grow in the US, it is growing at an ever decreasing rate as the population is aging, the baby boom generation is entering into retirement, and decades ago birth rates fell. The total labor force grew at a 1.2% annual rate between 1994 and 2004, at a 0.6% rate between 2004 and 2014, and is forecast by the BLS to grow at a 0.5% rate between 2014 and 2024. But it is now 2017. With a decelerating rate of growth, a growth rate in the latter part of a period will be less than in the early part of a period. Taking account of where the labor force is now, growth going forward to 2024 will only be 0.3% (with these figures calculated based on the full numbers before round-off). This is not much. The labor force will be higher in 2024 than it is now, but not by much. The labor force grew at a relatively high rate from the 1950s to the 1970s (of a bit over 2% a year), but then started to level off. As it did, it continued to grow but at an ever slower rate. There was also a dip after the economic collapse of 2008/09, but then recovered to its previous path. When unemployment is high, some workers drop out of the labor force for a period. But we are now back to what the path before would have predicted. 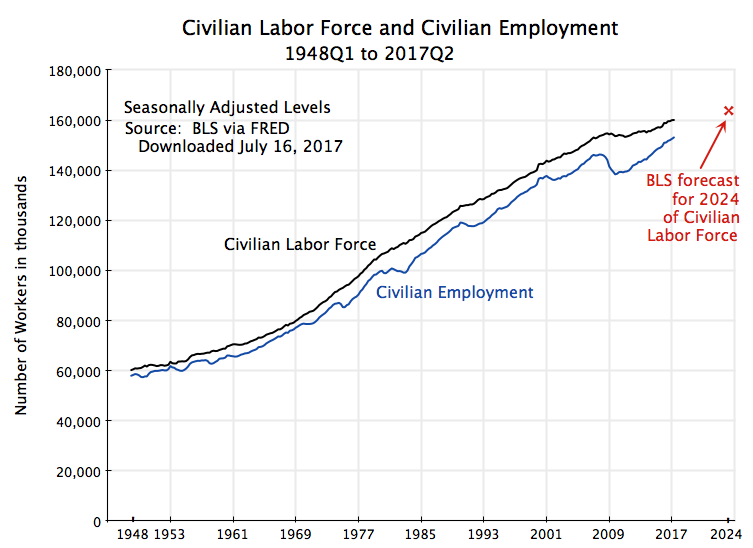 If the BLS forecasts are correct, growth in the labor force will continue, but at a rate of just 0.3% from where it is now to 2024, to the point shown in red on the chart. And this is basically a continuation of the path followed over the last few decades. 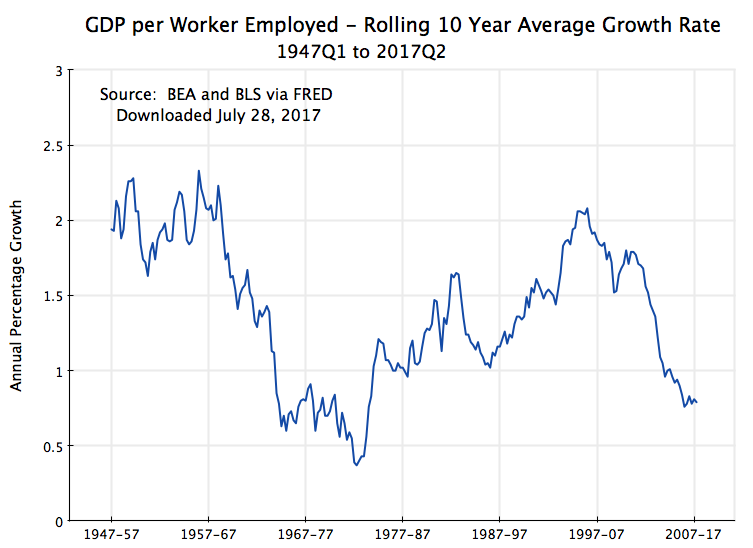 One should in particular not expect the labor force to get back to the rapid growth rate (of over 2% a year) the US had from the 1950s to the 1970s. This would require measures such as that immigration be allowed to increase dramatically (which does not appear to enjoy much support in the Trump administration), or that grandma and grandpa be forced back into the labor force in their 70s and 80s rather than enjoy their retirement years (where it is not at all clear how this would “make America great again”). I have spoken so far on the figures for the labor force, since that is what the BLS and others can forecast based largely on demographics. Civilian employment will then be some share of this, with the difference equal to the number of unemployed. That curve is also shown, in blue, in the chart. There will always be some unemployment, and in an economic downturn the rate will shoot up. But even in conditions considered to be “full employment” there will be some number of workers unemployed for various reasons. While economists cannot say exactly what the “full employment rate of unemployment” will be (it will vary over time, and will also depend on various factors depending on the make-up of the labor force), it is now generally taken to be in the range of a 4 to 5% unemployment rate. The current rate of unemployment is 4.4%. It is doubtful it will be much lower than this in the future (at least not for any sustained period). Hence if the economy is at full employment in 2024, with unemployment at a similar rate to what it is now, the rate of growth of total employment from now to 2024 will be the same as the rate of growth of the labor from now to then. That is, if unemployment is a similar share of the total labor force in 2024 as it is now, the rates of growth of the labor force and of total employment will match. And that rate of growth is 0.3% a year. This rate of growth in what employment can be going forward (at 0.3%) is well below what it was before. Total employment grew at an annual rate of 2.1% over the 20 years between 1947 and 1967, and a slightly higher 2.2% between 1967 and 1987. With total employment able to grow only at 1.8 or 1.9% points per annum less than what was seen between 1947 and 1987, total GDP growth (for any given rate of productivity growth) will be 1.8 or 1.9% points less. This is not a small difference. Growth in productivity (how much GDP is produced per worker employed) is then the other half of the equation. What it will be going forward is hard to predict; economists have never been very good at this. But one can get a sense of what is plausible based on the historical record. These 20 year periods broadly coincide with the pattern often noted for the post-World War II period for the US: Relatively high growth (2.0% per year) from the late 1940s to the late 1960s; a slowdown from then to the mid 1980s (to 0.9%); a return to more rapid growth in productivity in the 1990s / early 2000s, although not to as high as in the 1950s and 60s (1.5% for 1987 to 2007); and then, after the economic collapse of 2008/2009, only a very modest growth (0.8% for 2007 to 2017, but much less from 2010 onwards). Note also that these break points all coincide, with one exception (1987), with years where the economy was operating at full employment. In the one exception (1987, near the end of the Reagan administration) unemployment was still relatively high at 6.6%. While one might expect productivity levels to reach a local peak when the economy is at or close to full employment, that is not always true (the relationship is complex), and is in any case controlled for here by the fact the break points coincide (with the one exception) with full employment years. Productivity, averaged over 10 year periods, grew at around 2% a year from the late 1940s up to the late 1960s. It then started to fall, bottoming out at roughly 0.5% in the 1970s, before reverting to a higher pace. It reached 2% again in the 10 year period of 1995 to 2005, but only for a short period before starting to fall again. And as noted before, it fell to 0.8% for the 2007 to 2017 period. Employment grew at over 2% a year between the late 1940s and 1987. This was the period of the post-war recovery and baby boom generation coming of working age. 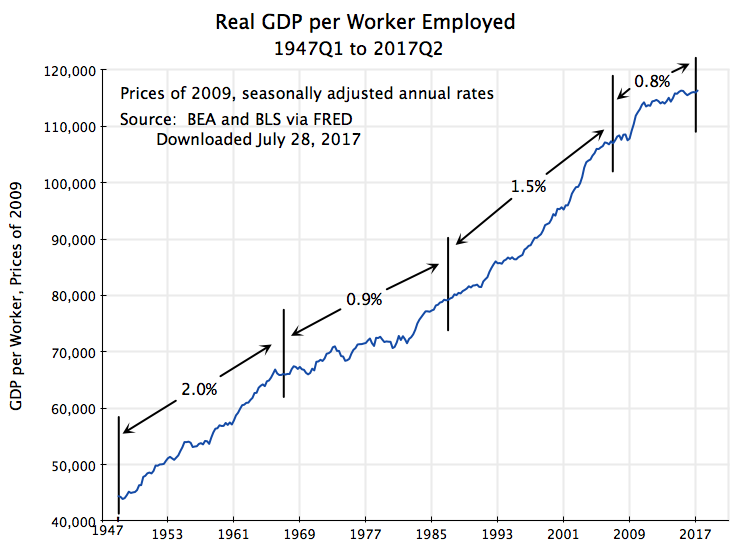 With GDP per worker growing at 2.0% a year between 1947 and 1967, total GDP grew at a 4.1% rate. It still grew at a 3.1% rate between 1967 and 1987 despite productivity growth slowing to just 0.9%, as the labor force continued to grow rapidly over this period. And total GDP continued to grow at a 3.1% rate between 1987 and 2007 despite slower employment (and labor force) growth, as a recovery in productivity growth (to a 1.5% pace) offset the slower availability of labor. It might, at first glance, appear from this that a return to 3% GDP growth (or even 4%) is quite doable. But it is not. 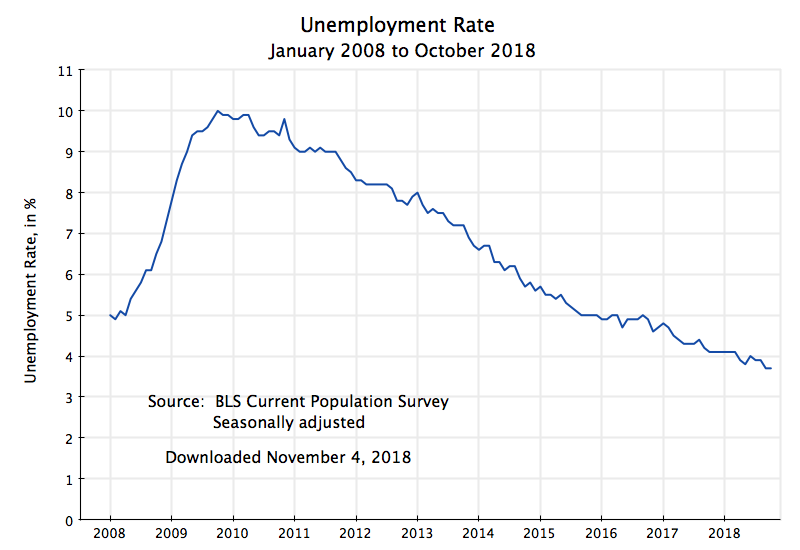 Employment growth fell to a pace of just 0.6% between 2007 and 2017 (and the unemployment rates were almost exactly the same in early 2007, at 4.5%, and now, at 4.4%, so this matched labor force growth). Going forward, as discussed above, the labor force is forecast to grow at a 0.3% pace between now and 2024. To get to a 3% GDP growth rate now at such a pace of labor growth, one would need productivity to grow at a 2.7% pace. To get a 4% GDP growth, productivity would have to grow at a 3.7% pace. But productivity growth in the US since 1947 has never been able to get much above a 2% pace for any sustained period. To go well beyond this would be unprecedented. D. Why Does This Matter? And What Can Be Achieved? This table works out the implications of varying rates of hypothetical GDP growth, between 1.0% and 4.0%. Population growth in the US is forecast by the Census Bureau at 0.8% a year (for the period to the 2020s). It is higher than the forecast pace of labor force growth (of 0.3% in the BLS figures) primarily because of the aging of the population, so a higher and higher share of the adult population is entering their retirement years. The result is that GDP growth at 1.0% a year will be just 0.2% a year in per capita terms with a 0.8% population growth rate. After 30 years (roughly one generation) this will cumulate to a total growth in per capita income of just 6%. But GDP growth at 2% a year will, by the same calculation, cumulate to total per capita income growth of 43%, to 91% with GDP growth of 3%, and to 155% with GDP growth of 4%. These differences are huge. What might appear to be small differences in GDP growth rates add up over time to a lot. It does matter. [Note that this does not address the distribution issue. Overall GDP per capita may grow, as it has over the last several decades, but all or almost all may go only to a few. As a post on this blog from 2015 showed, only the top 10% of the income distribution saw any real income growth at all between 1980 and 2014 – real incomes per household fell for the bottom 90%. And the top 1%, or richer, did very well. Looking forward, what pace of productivity growth might be expected? As discussed above, while the US was able to achieve productivity growth at a rate of about 2.0% in the 1950s and 1960s, since then it was able to achieve a rate as high as this over a ten year period only once (between 1995 and 2005), and only very briefly. And over time, there is some evidence that reaching the rates of productivity growth enjoyed in the past is becoming increasingly difficult. A reason for this is the changing structure of the economy. Productivity growth has been, and continues to be, relatively high in manufacturing and especially in agriculture. Mechanization and new technologies (including biological technologies) can raise productivity in manufacturing and in agriculture. It is more difficult to do this in services, which are often labor intensive and personal. And with agriculture and manufacturing a higher share of the economy in the past than they are now (precisely because their higher rates of productivity growth allowed more to be produced with fewer workers), the overall pace of productivity growth in the economy will move, over time, towards the slower rate found in services. The following table illustrates this. The figures are taken from an earlier blog post, which looked at the changing shares of the economy resulting from differential rates of productivity growth. 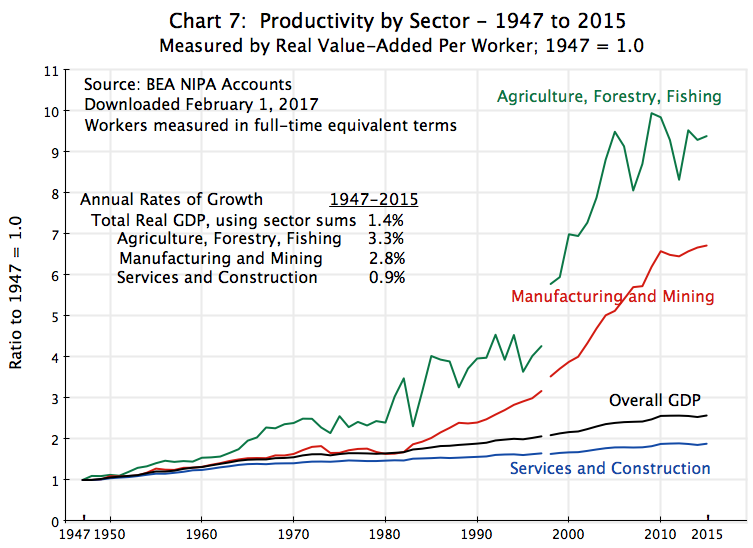 The top line (with the figures in bold) shows the overall rates of productivity growth between 1947 and 2015 in agriculture (3.3%), manufacturing (2.8%), services (0.9%), and overall (1.4%). 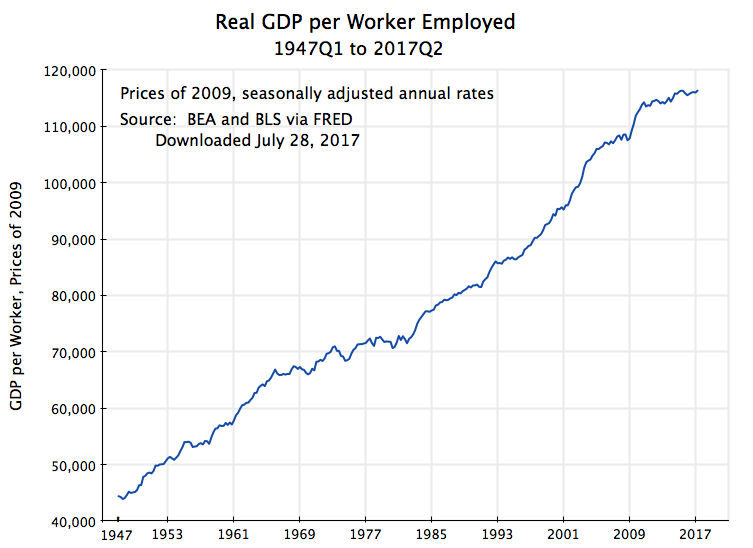 The overall is for GDP, and matches the average for growth in GDP per employed worker between 1947 and 2017 in the chart shown at the top of this post. The remaining lines on the table show what the pace of overall productivity growth would then have been, hypothetically, at these same rates of productivity growth by sector but with the sector shares in GDP what they were in 1947, or in 1980, or in 2015. 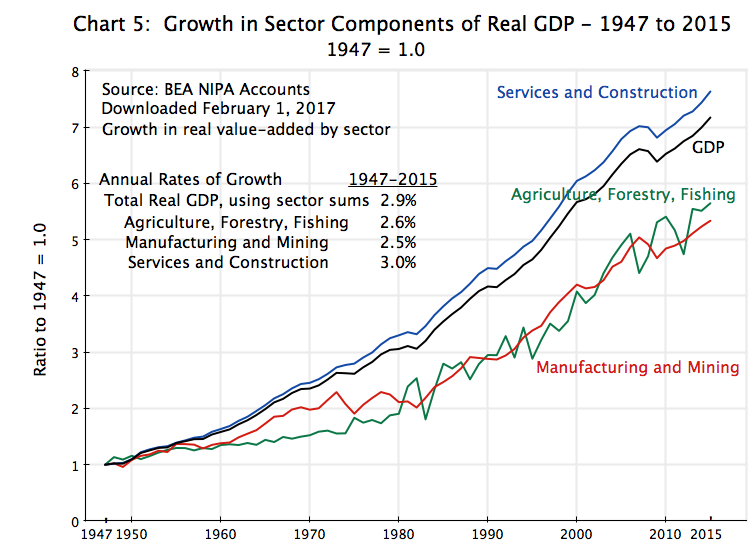 In 1947, with the sector shares of agriculture and manufacturing higher than what they were later, and services correspondingly lower, the pace of productivity growth overall (i.e. for GDP) would have been 1.7%. But at the sector shares of 2015, with services now accounting for 85% of the economy, the overall rate of productivity growth would have been just 1.2%, or 0.5% lower. This is just an illustrative calculation, and shows the effects of solely the shifts in sector shares with the rates of productivity growth in the individual sectors left unchanged. But those individual sector rates could also change over time, and did. Briefly (see the earlier blog post for a discussion), the rate of productivity growth in services decelerated sharply after the mid-1960s; the pace in agriculture was remarkably steady; while the pace in manufacturing accelerated after the early 1980s (explaining, to a large extent, the sharp fall in the manufacturing share of the economy from 24% in 1980 to just 14% in 2015). But with services dominating the economy (74% in 1980, rising to 85% in 2015), it was the pace of productivity growth in services, and its pattern over time, which dominated. What can be expected going forward? The issue is a huge one, and goes far beyond what is intended for this post. But especially given the headwinds created by the structural transformation in the economy of the past 70 years towards a dominance by the services sector, it is unlikely that the economy will soon again reach a pace of 2% productivity growth a year for a sustained period of a decade or more. Indeed, a 1.5% rate would be exceptionally good. And with labor force growth of 0.3%, a 1.5% pace for productivity would imply a 1.8% rate for overall GDP. This is well below the 3% rate that the Trump administration claims it will achieve, and of course even further below the 4% (and 5% and 6%) rates that Trump has claimed he would get. As a simple identity, GDP will equal GDP per worker employed (productivity) times the number of workers employed. Growth in GDP will thus equal the sum of the growth rates of these two components. With a higher share of our adult population aging into the normal retirement years, the labor force going forward (to 2024) is forecast to grow at just 0.3% a year. That is not much. Overall GDP growth will then be this 0.3% plus the growth in productivity. That growth in the post World War II period has never much exceeded 2% a year for any 10-year period. If we are able to get to such a 2% rate of productivity growth again, total GDP would then be able to grow at a 2.3% rate. But this is below the 3% figure the Trump administration has assumed for its budget, and far below the 4% (or 5% or 6%) rates Trump has asserted he would achieve. Trump’s forecasts (whether 3% or 4% or 5% or 6%) are unrealistic. But a 2% rate for productivity growth is itself unlikely. It was achieved in the 1950s and 1960s when agriculture and manufacturing were greater shares of the economy, and it has been in those sectors where productivity growth has been most rapid. It is harder to raise productivity quickly in services, and services now dominate the economy. Finally, it is important to note that we are speaking of growth rates in labor, productivity, and GDP over multi-year, sustained, periods. That is what matters to what living standards can be achieved over time, and to issues like the long-term government budget projections. There will be quarter to quarter volatility in the numbers for many reasons, including that all such figures are estimates, derived from surveys and other such sources of information. It is also the case that an exceptionally high figure in one quarter will normally soon be followed by an exceptionally low figure in some following quarter, as the economy, as well as the statistical measure of it, balances out over time. Thus, for example, the initial estimate (formally labeled the “advance estimate”) for GDP growth in the second quarter of 2017, released on July 28, was 2.6% (at an annual rate). Trump claimed this figure to be “an unbelievable number” showing that the economy is doing “incredibly well”, and claimed credit for what he considered to be a great performance. But it is a figure for just one quarter, and will be revised in coming months as more data become available. It also follows an estimate of GDP growth in the first quarter of 2017 of just 1.2%. Thus growth over the first half of the year averaged 1.9%. Furthermore, productivity (GDP per worker) grew at just a 0.5% rate over the first half of 2017. While a half year is too short a period for any such figure on productivity to be taken seriously, such a performance is clearly nothing special. The 1.9% rate of growth of GDP in the first half of 2017 is also nothing special. It is similar to the rate achieved over the last several years, and is in fact slightly below the 2.1% annual rate seen since 2010. More aptly, in the 28 calendar quarters between the second quarter of 2010 and the first quarter of 2017, GDP grew at a faster pace than that 2.6% estimated rate a total of 13 times, or almost half. The quarter to quarter figures simply bounce around, and any figure for a single quarter is not terribly meaningful by itself. It therefore might well be the case that a figure for GDP growth of 3%, or even 4% or higher, is seen for some quarter or even for several quarters. But there is no reason to expect that the economy will see such rates on a sustained basis, as the Trump administration has predicted. A major theme of Trump, both during his campaign and now as president, has been that jobs in manufacturing have been decimated as a direct consequence of the free trade agreements that started with NAFTA. He repeated the assertion in his speech to Congress of February 28, where he complained that “we’ve lost more than one-fourth of our manufacturing jobs since NAFTA was approved”, but that because of him “Dying industries will come roaring back to life”. He is confused. But to be fair, there are those on the political left as well who are similarly confused. All this reflects a sad lack of understanding of history. Manufacturing jobs have indeed been declining in recent decades, and as the chart above shows, they have been declining as a share of total jobs in the economy since the 1940s. Of all those employed, the share employed in manufacturing (including mining) fell by 7.6% points between 1994 (when NAFTA entered into effect) and 2015 (the most recent year in the sector data of the Bureau of Economic Analysis, used for consistency throughout this post), a period of 21 years. But the share employed in manufacturing fell by an even steeper 9.2% points in the 21 years before 1994. The decline in manufacturing jobs (both as a share and in absolute number) is nothing new, and it is wrong to blame it on NAFTA. It is also the case that manufacturing production has been growing steadily over this period. Total manufacturing production (measured in real value-added terms) rose by 64% over the 21 years since NAFTA went into effect in 1994. And this is also substantially higher than the 42% real growth in the 21 years prior to 1994. Blaming NAFTA (and the other free trade agreements of recent decades) for a decline in manufacturing is absurd. Manufacturing production has grown. Manufacturing jobs have nonetheless indeed declined. To understand why, one needs to look at what has happened to productivity, not only in manufacturing but also in the other sectors of the economy (in particular in services). And I would suggest that one could learn much by an examination of the similar factors behind the even steeper decline over the years in the share of jobs in agriculture. It is not because of adverse effects of free trade. The US is in fact the largest exporter of food products in the world. Yet the share of workers employed in the agricultural sectors (including forestry and fishing) is now just 0.9% of the total. It used to be higher: 4.3% in 1947 and 8.4% in 1929 (using the BEA data). If one wants to go really far back, academics have estimated that agricultural employment accounted for 74% of all US employment in 1800, with this still at 56% in 1860. Employment in agriculture has declined so much, from 74% of total employment in 1800 to 8.4% in 1929 to less than 1% today, because those employed in agriculture are far more productive today than they were before. And while it leads to less employment in the sector, whether as a share of total employment or in absolute numbers, higher productivity is a good thing. The US could hardly enjoy a modern standard of living if 74% of those employed still had to be working in agriculture in order to provide us food to eat. And while stretching the analysis back to 1800 is extreme, one can learn much by examining and understanding the factors behind the long-term trends in agricultural employment. Manufacturing is following the same basic path. And there is nothing wrong with that. Indeed, that is exactly what one would hope for in order for the economy to grow and develop. Furthermore, the effects of foreign trade on employment in the sectors, positive or negative, are minor compared to the long-term impacts of higher productivity. In the post below we will look at what would have happened to employment if net trade would somehow be forced to zero by Trumpian policies. The impact relative to the long term trends would be trivial. This post will focus on the period since 1947, the earliest date for which the BEA has issued data on both sector outputs and employment. The shares of agriculture as well as of manufacturing in both total employment and in output (with output measured in current prices) have both declined sharply over this period, but not because those sectors are producing less than before. Indeed, their production in real terms are both far higher. Employment in those sectors has nevertheless declined in absolute numbers. The reason is their high rates of productivity growth. Importantly, productivity in those two sectors has grown at a faster pace than in the services sector (the rest of the economy). As we will discuss, it is this differential rate of productivity growth (faster in agriculture and in manufacturing than in services) which explains the decline in the share employed in agriculture and manufacturing. These structural changes, resulting ultimately from the differing rates of productivity growth in the sectors, can nonetheless be disruptive. With fewer workers needed in a sector because of a high rate of productivity growth, while more workers are needed in those sectors where productivity is growing more slowly (although still positively and possibly strongly, just relatively less strongly), there is a need for workers to transfer from one sector to another. This can be difficult, in particular for individuals who are older or who have fewer general skills. But this was achieved before in the US as well as in other now-rich countries, as workers shifted out of agriculture and into manufacturing a century to two centuries ago. Critically important was the development of the modern public school educational system, leading to almost universal education up through high school. The question the country faces now is whether the educational system can be similarly extended today to educate the workers needed for jobs in the modern services economy. First, however, is the need to understand how the economy has reached the position it is now in, and the role of productivity growth in this. 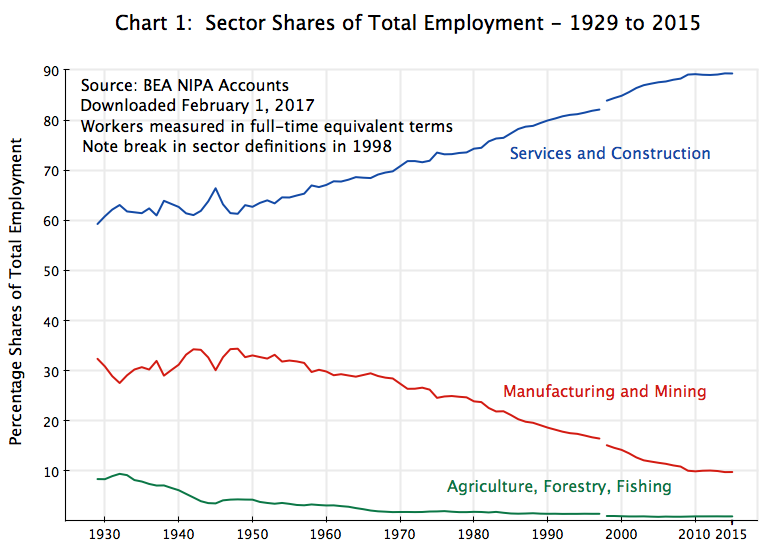 As Chart 1 at the top of this post shows, employment in agriculture and in manufacturing have been falling steadily as a share of total employment since the 1940s, while jobs in services have risen. [A note on the data: The data here comes from the Bureau of Economic Analysis (BEA), which, as part of its National Income and Product Accounts (NIPA), estimates sector outputs as well as employment. Employment is measured in full-time equivalent terms (so that two half-time workers, say, count as the equivalent of one full-time worker), which is important for measuring productivity growth. 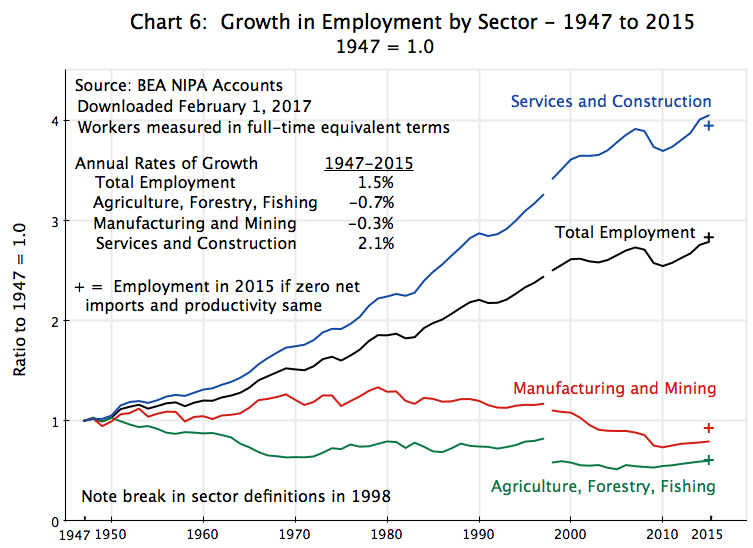 And while the BEA provides figures on its web site for employment going all the way back to 1929, the figures for sector output on its web site only go back to 1947. Thus while the chart at the top of this post goes back to 1929, all the analysis shown below will cover the period from 1947 only. Note also that there is a break in the employment series in 1998, when the BEA redefined slightly how some of the detailed sectors would be categorized. They unfortunately did not then go back to re-do the categorizations in a consistent way in the years prior to that, but the changes are small enough not to matter greatly to this analysis. And there were indeed similar breaks in the employment series in 1948 and again in 1987, but the changes there were so small (at the level of aggregation of the sectors used here) as not to be noticeable at all. Also, for the purposes here the sector components of GDP have been aggregated to just three, with forestry and fishing included with agriculture, mining included with manufacturing, and construction included with services. As a short hand, these sectors will at times be referred to simply as agriculture, manufacturing, and services. Agriculture is falling, and falling to an extremely small share of GDP (to less than 1% of GDP in 2015). 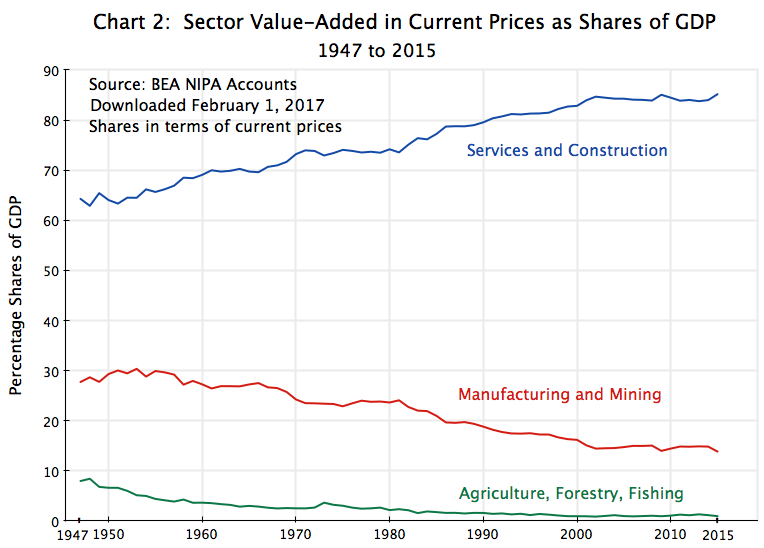 Manufacturing and mining is similarly falling from the mid-1950s, while services and construction is rising more or less steadily. On the surface, all this appears to be similar to what was seen in Chart 1 for employment shares. It also might look like the employment shares are simply following the shifts in output shares. But there is a critical difference. The shares of workers employed is a measure of numbers of workers (in full-time equivalent terms) as a share of the total. That is, it is a measure in real terms. But the shares of sector outputs in Chart 2 above is a measure of the shares in terms of current prices. They do not tell us what is happening to sector outputs in real terms. Here, the output shares are not changing all that much. 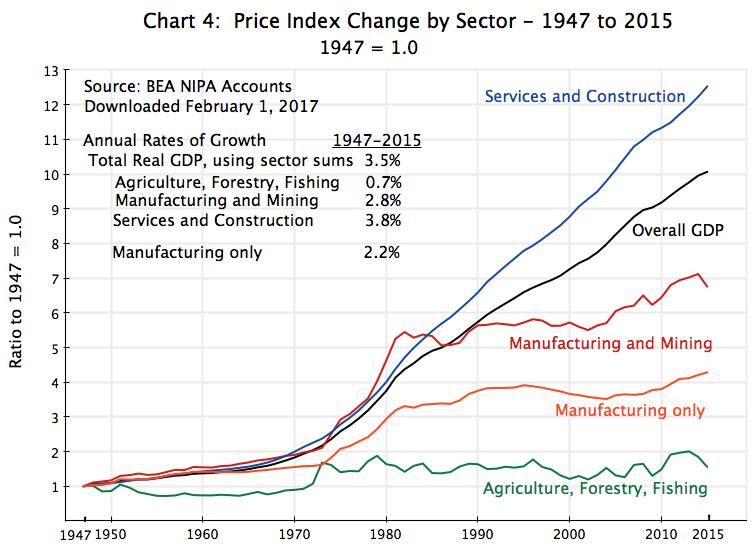 There is only a small decline in agriculture (from 8% of the total in 1947 to 7% in 2015), some in manufacturing (from 28% to 22%), and then the mirror image of this in services (from 64% to 72%). The changes in the shares were much greater in Chart 2 above for sector output shares in current prices. Many might find the relatively modest shifts in the shares of sector outputs when measured in constant price terms to be surprising. We were all taught in our introductory Economics 101 class of Engel Curve effects. Ernst Engel was a German statistician who, in 1857, found that at the level of households, the share of expenditures on basic nourishment (food) fell the richer the household. Poorer households spent a relatively higher share of their income on food, while better off households spent less. One might then postulate that as a nation becomes richer, it will see a lower share of expenditures on food items, and hence that the share of agriculture will decline. But there are several problems with this theory. First, for various reasons it may not apply to changes over time as general income levels rise (including that consumption patterns might be driven mostly by what one observes other households to be consuming at the time; i.e. “keeping up with the Joneses” dominates). Second, agricultural production spans a wide range of goods, from basic foodstuffs to luxury items such as steak. The Engel Curve effects might mostly be appearing in the mix of food items purchased. Third, and perhaps most importantly, the Engel Curve effects, if they exist, would affect production only in a closed economy where it was not possible to export or import agricultural items. But one can in fact trade such agricultural goods internationally. Hence, even if domestic demand fell over time (due perhaps to Engel Curve effects, or for whatever reason), domestic producers could shift to exporting a higher share of their production. There is therefore no basis for a presumption that the share of agricultural production in total output, in real terms, should be expected to fall over time due to demand effects. The same holds true for manufacturing and mining. Their production can be traded internationally as well. These are the changes in the price indices published by the BEA, with all set to 1947 = 1.0. Compared to the others, the change in agricultural prices over this 68 year period is relatively small. The price of manufacturing and mining production rose by far more. And while a significant part of this was due to the rise in the 1970s of the prices of mined products (in particular oil, with the two oil crises of the period, but also in the prices of coal and other mined commodities), it still holds true for manufacturing alone. Even if one excludes the mining component, the price index rose by far more than that of agriculture. But far greater was the change in the price of services. It rose to an index value of 12.5 in 2015, versus an index value of just 1.6 for agriculture in that year. And the price of services rose by double what the price of manufacturing and mining rose by (and even more for manufacturing alone). With the price of services rising relative to the others, the share of services in GDP (in current prices) will then rise, and substantially so given the extent of the increase in its relative price, despite the modest change in its share in constant price terms. Similarly, the fall in the shares of agriculture and of manufacturing (in current price terms) will follow directly from the fall in their prices (relative to the price of services), despite just a modest reduction in their shares in real terms. The question then is why have we seen such a change in relative prices. And this is where productivity enters. All sector outputs rose, and by substantial amounts. While Trump has asserted that manufacturing is dying (due to free trade treaties), this is not the case at all. Manufacturing (including mining) is now producing 5.3 times (in real terms) what it was producing in 1947. Furthermore, manufacturing production was 64% higher in real terms in 2015 than it was in 1994, the year NAFTA went into effect. This is far from a collapse. The 64% increase over the 21 years between 1994 and 2015 was also higher than the 42% increase in manufacturing production of the preceding 21 year period of 1973 to 1994. There was of course much more going on than any free trade treaties, but to blame free trade treaties on a collapse in manufacturing is absurd. There was no collapse. Production in agriculture also rose, and while there was greater volatility (as one would expect due to the importance of weather), the increase in real output over the full period was in fact very similar to the increase seen for manufacturing. But the biggest increase was for services. Production of services was 7.6 times higher in 2015 than in 1947. Despite the large increases in sector production over this period, employment in agriculture fell as did employment in manufacturing. One unfortunately cannot say with precision by how much, given the break in the employment series in 1998. However, there were drops in the absolute numbers employed in manufacturing both before and after the 1998 break in the series, while in agriculture there was a fall before 1998 (relative to 1947) and a fairly flat series after. The change in the agriculture employment numbers in 1998 was relatively large for the sector, but since agricultural employment was such a small share of the total (only 1%), this does not make a big difference overall. In contrast to the falls seen for agriculture and manufacturing, employment in the services sector grew substantially. This is where the new jobs are arising, and this has been true for decades. Indeed, services accounted for more than 100% of the new jobs over the period. But one cannot attribute the decline in employment in agriculture and in manufacturing to the effects of international trade. The points marked with a “+” in Chart 6 show what employment in the sectors would have been in 2015 (relative to 1947) if one had somehow forced net imports in the sectors to zero in 2015, with productivity remaining the same. There would have been an essentially zero change for agriculture (while the US is the world’s largest food exporter, it also imports a lot, including items like bananas which would be pretty stupid to try to produce here). There would have been somewhat more of an impact on manufacturing, although employment in the sector would still have been well below what it had been decades ago. And employment in services would have been a bit less. While most production in the services sector cannot be traded internationally, the sector includes businesses such as banking and other finance, movie making, professional services, and other areas where the US is in fact a strong exporter. 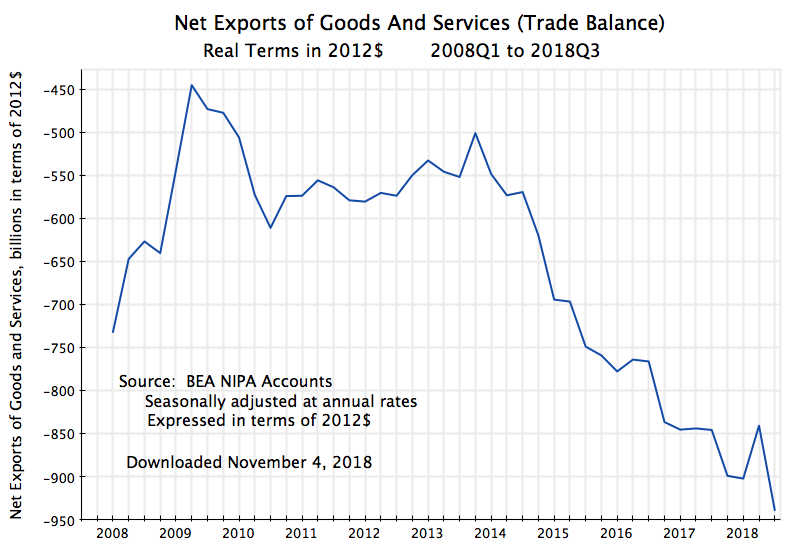 Overall, the US is a net exporter of services, and an abandonment of trade that forced all net imports (and hence net exports) to zero would lead to less employment in the sector. But the impact would be relatively minor. Productivity in agriculture grew at a strong pace, and by more than in either of the other two sectors over the period. With higher productivity per worker, fewer workers will be needed to produce a given level of output. Hence one can find that employment in agriculture declined over the decades, even though agricultural production rose strongly. Productivity in manufacturing similarly grew strongly, although not as strongly as in agriculture. In contrast, productivity in the services sector grew at only a modest pace. Most of the activities in services (including construction) are relatively labor intensive, and it is difficult to substitute machinery and new technology for the core work that they do. Hence it is not surprising to find a slower pace of productivity growth in services. But productivity in services still grew, at a positive 0.9% annual pace over the 1947 to 2015 period, as compared to a 2.8% annual pace for manufacturing and a 3.3% annual pace in agriculture. While one should not claim too much due to the break in the series in 1998, the path for productivity in agriculture on a logarithmic scale is remarkably flat over the full period (once one abstracts from the substantial year to year variation – short term fluctuations that one would expect from dependence on weather conditions). That is, the chart indicates that productivity in agriculture grew at a similar pace in the early decades of the period, in the middle decades, and in the later decades. In contrast, it appears that productivity in manufacturing grew at a certain pace in the early decades up to the early 1970s, that it then leveled off for about a decade until the early 1980s, and that it then moved to a rate of growth that was faster than it had been in the first few decades. Furthermore, the pace of productivity growth in manufacturing following this turn in the early 1980s was then broadly similar to the pace seen in agriculture in this period (the paths are then parallel so the slope is the same). The causes of the acceleration in the 1980s would require an analysis beyond the scope of this blog post. But it is likely that the corporate restructuring that became widespread in the 1980s would be a factor. Some would also attribute the acceleration in productivity growth to the policies of the Reagan administration in those years. However, one would also then need to note that the pace of productivity growth was similar in the 1990s, during the years of the Clinton administration, when conservatives complained that Clinton introduced regulations that undid many of the changes launched under Reagan. Finally, and as noted before, the pace of productivity growth in services was substantially less than in the other sectors. From the chart in logarithms, it appears the pace of productivity growth was relatively robust in the initial years, up to the mid-1960s. While slower than the pace in manufacturing or in agriculture, it was not that much slower. But from the mid-1960s, the pace of growth of productivity in services fell to a slower, albeit still positive, pace. Furthermore, that pace appears to have been relatively steady since then. The growth rate of output will be the simple sum of the growth rate of employment in a sector and the growth rate of its productivity (output per worker). The figures here do indeed add up as they should. They do not tell us what causes what, however, and that will be addressed next. Productivity is driven primarily by technological change. While management skills and a willingness to invest to take advantage of what new technologies permit will matter over shorter periods, over the long term the primary driver will be technology. And as seen in the chart above, technological progress, and the resulting growth in productivity, has proceeded at a different pace in the different sectors. 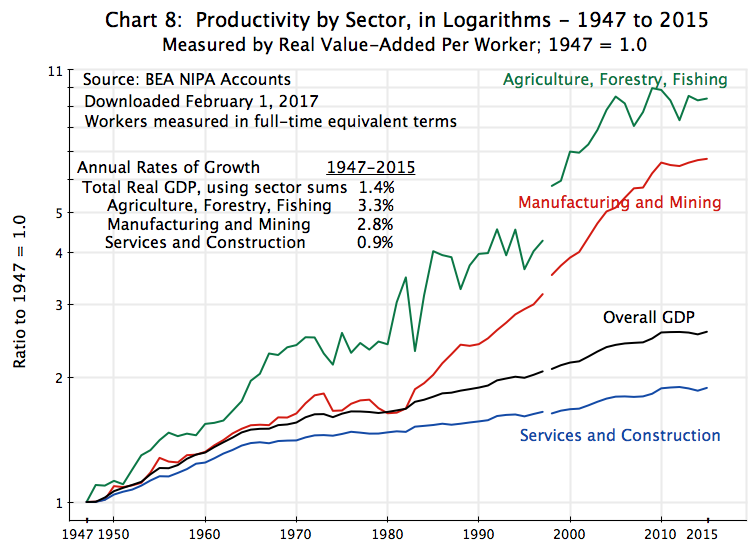 Productivity (real output per worker) has grown fastest over the last 68 years in agriculture (a pace of 3.3% a year), and fast as well in manufacturing (2.8% a year). In contrast, the rate of growth of productivity in services, while positive, has been relatively modest (0.9% a year). But as average incomes have grown, there has been an increased domestic demand in what the services sector produces, not only in absolute level but also as a share of rising incomes. Since services largely cannot be traded internationally (with a few exceptions), the increased demand for services will need to be met by domestic production. With overall production (GDP) matching overall incomes, and with demand for services growing faster than overall incomes, the growth of services (in real terms) will be greater than the growth of real GDP, and therefore also greater than growth in the rest of the economy (agriculture and manufacturing; see Chart 5). The share of services in real GDP will then rise (Chart 3). To produce this, the services sector needed more labor. With productivity in the services sector growing at a slower pace (in relative terms) than that seen in agriculture and in manufacturing, the only way to obtain the labor input needed was to increase the share of workers in the economy employed in services (Chart 1). And depending on the overall rate of labor growth as well as the size of the differences in the rates of productivity growth between the sectors, one could indeed find that the shift in workers out of agriculture and out of manufacturing would not only lead to a lower relative share of workers in those sectors, but also even to a lower absolute number of workers in those sectors. And this is indeed precisely what happened, with the absolute number of workers in agriculture falling throughout the period, and falling in manufacturing since the late 1970s (Chart 6). Finally, the differential rates of productivity growth account for the relative price changes seen between the sectors. To be able to hire additional workers into services and out of agriculture and out of manufacturing, despite a lower rate of productivity growth in services, the price of services had to rise relative to agriculture as well as manufacturing. Services became more expensive to produce relative to the costs of agriculture or manufacturing production. And this is precisely what is seen in Chart 4 above on prices. To summarize, productivity growth allowed all sectors to grow. With the higher incomes, there was a shift in demand towards services, which led it to grow at a faster pace than overall incomes (GDP). But for this to be possible, particularly as its pace of productivity growth was slower than the pace in agriculture and in manufacturing, workers had to shift to services from the other sectors. The effect was so great (due to the differing rates of growth of productivity) that employment in services rose to the point where services now employs close to 90% of all workers. To be able to hire those workers, the price of services had to grow relative to the prices of the other sectors. 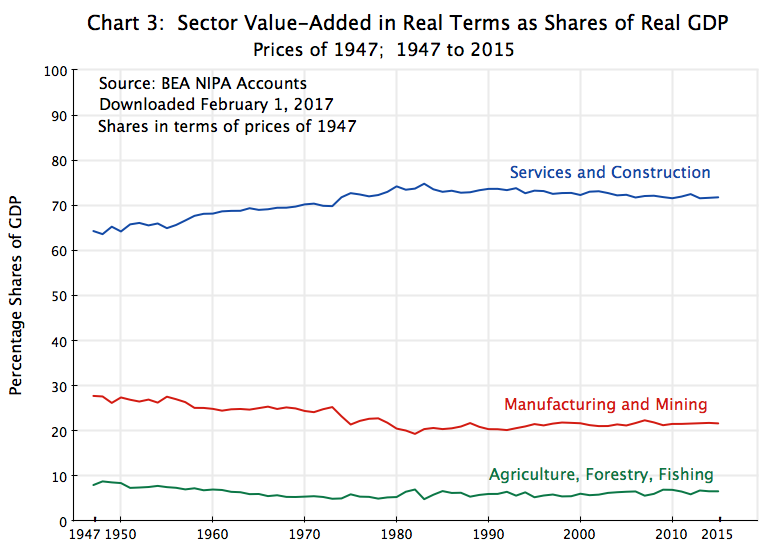 As a consequence, while there was only a modest shift in sector shares over time when measured in real terms (constant prices of 1947), there was a much larger shift in sector shares when measured in current prices. The decline in the number of workers in manufacturing should not then be seen as surprising nor as a reflection of some defective policy. Nor was it a consequence of free trade agreements. Rather, it was the outcome one should expect from the relatively rapid pace of productivity growth in manufacturing, coupled with an economy that has grown over the decades with this leading to a shift in domestic demand towards services. The resulting path for manufacturing was then the same basic path as had been followed by agriculture, although it has been underway longer in agriculture. As a result, fewer than 1% of American workers are now employed in agriculture, with this possible because American agriculture is so highly productive. One should expect, and indeed hope, that the same eventually becomes true for manufacturing as well.